All of the Palmetto Harmony™ line of products are third party lab tested by an ISO certified lab for consistency and safety, no corner is cut or expense spared in the making of any product. Palmetto Harmony (PH) infused whole plant extract. This product contains a broad Terpene profile and all other naturally occurring compounds within the Cannabis Sativa L plant. 100% VG Whole plant full spectrum oil. Meant to be used in a sub ohm tank at 24 watts (280 degrees) for maximum absorption. 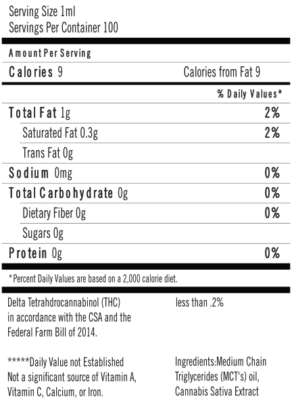 This product contains no PG, flavoring, chemicals, or CBD Crystalline. This product was grown organically, no pesticides, herbicides, or chemicals where used. May help with Neurological and inflammation issues. Pharmacuetical grade MCT and oil extracted from the hemp plant. Palmetto Harmony (PH) infused whole plant extract into fractionated coconut oil (MCT) no artificial flavoring or additives. 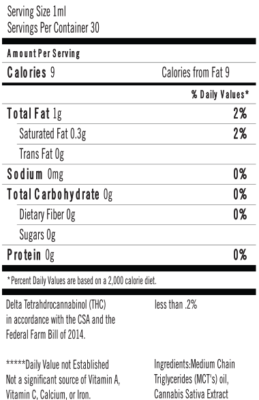 This product contains a broad Terpene profile and all other naturally occurring compounds within the Cannabis Sativa L plant.